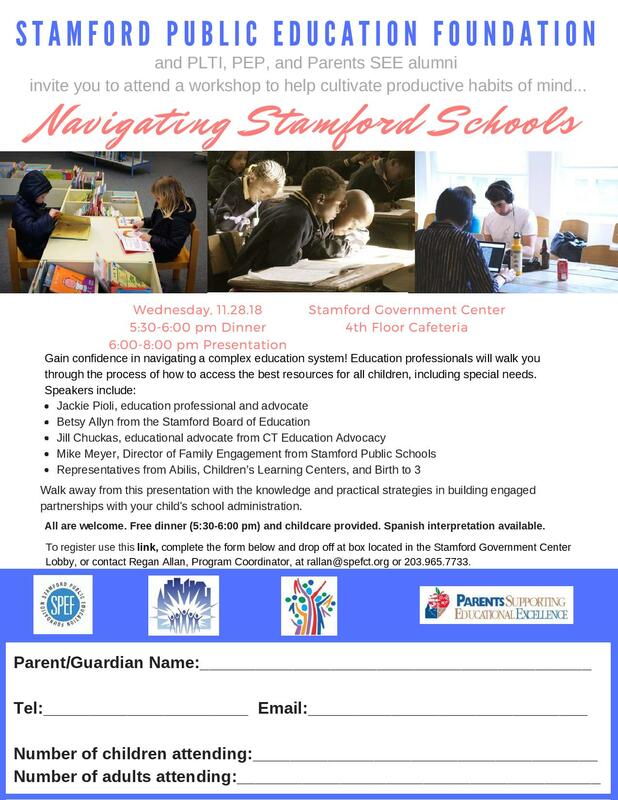 STAMFORD, CT — November 12, 2018 — The Stamford Public Education Foundation (SPEF), in partnership with the Alumni Networks of the Parent Leadership Training Institute (PLTI), People Empowering People (PEP) and Parents Supporting Educational Excellence (PSEE), invite Stamford residents to attend a free workshop entitled, Navigating Stamford Schools, on Wednesday, November 28th from 6PM-8PM at Stamford Government Center’s 4th Floor Cafeteria. This event, which builds upon the Stamford Public School’s mission of cultivating productive habits of mind, will provide information and practical strategies for parents to build effective and productive partnerships with school administration. The following professionals will be on hand providing insights into best resources for all children, including those with special needs. All are welcomed to attend this free event. Childcare will be available, and dinner will be provided from 5:30PM-6PM. Spanish interpretation will also be available. To register, please contact Regan Allan, Program Coordinator at rallan@spefct.org or 203.965.7733.